From the time the goods are received until they leave the warehouse: once it is securely placed on the FurniBox, direct contact with your furniture ceases in the warehouse. In this way even the most sensitive items can be moved, stored and stacked in the warehouse safely and quickly and delivered in complete consignments - without any risk of damage. Why is the most valuable part of your storage area above your goods? Very simply: the FurniBox gives you the opportunity to double or even triple your storage capacity, without having to rent a single additional square metre. Storing furniture in an orderly and organised fashion and still being able to access it quickly is no longer an unfulfilled dream. The FurniBox creates space and order in low-level warehouses and additionally makes sure that things which belong together stay together. The FurniBox can be quickly and easily moved using any standard towing vehicle. With the FurniBox you have direct and quick access to your goods, no matter how high they are in your high rack storage. An especially practical feature here is that even pieces of furniture that stick out over the top edge can be kept in a FurniBox so that bulky items, too, can be stored well protected and available at any time. You can effortlessly transport loads of up to 800kg with the Universal FurniBox, even on uneven surfaces. 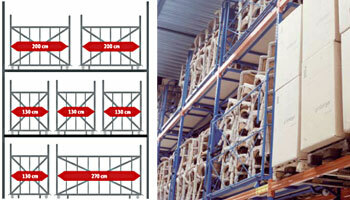 The stable frame structure of the Universal FurniBox and the high quality of its wheels make this possible.